We offer a full interior design service, including lighting design, colour consultancy, materials selection, bespoke joinery, kitchen and bathroom detailing. Our Service goes beyond the exterior. Please also visit our portfolio of Renovations | 3D Architectural Designs | New Homes. The concept for this interior design concentrated on the integration of many elements to create a streamlined and uncluttered finish, which was crucial in achieving the illusion of space without sacrificing on functional components such as storage. The interior design to the front and older part of the house has been maintained with traditional cornices and skirting with a detailed archway becoming the transition point into the contrasting contemporary interior addition at the rear. Integrating storage into the design was a strong part of the brief. The layout incorporates a lot of storage without revealing that it does. The fridge and dishwasher have also been integrated and hidden in the kitchen design allowing the kitchen to maintain flush and clean line. An innovative, integrated speaker system was proposed in the living room, where the speakers become part of the wall and are plastered and painted over becoming completely unseen. This allowed a full speaker system incorporated into the design without any fixtures dominating the space or walls. The concept for this interior design concentrated on restoring and reinstating many of the home's traditional elements to enhance the original characteristics of this 1950's weatherboard cottage. This successful kitchen was designed to fit into the odd shaped section of the house without disrupting the flow and functionality of the kitchen. For a classic kitchen style, the kitchen cabinetry has recessed panelling finished in a sprayed enamel with an integrated fridge, corner pantry and dumb waiter. The kitchen benchtop is finished in 30mm thick Antique Brown Marble with an induction cooktop that blends perfectly with the colour. The design includes a servery window allowing access to the terrace area and views out to the harbour. Need some advise on your interiors? As it is just a few minutes walk from Freshwater Beach the concept for this interior is timber beach house - classic and colourful. 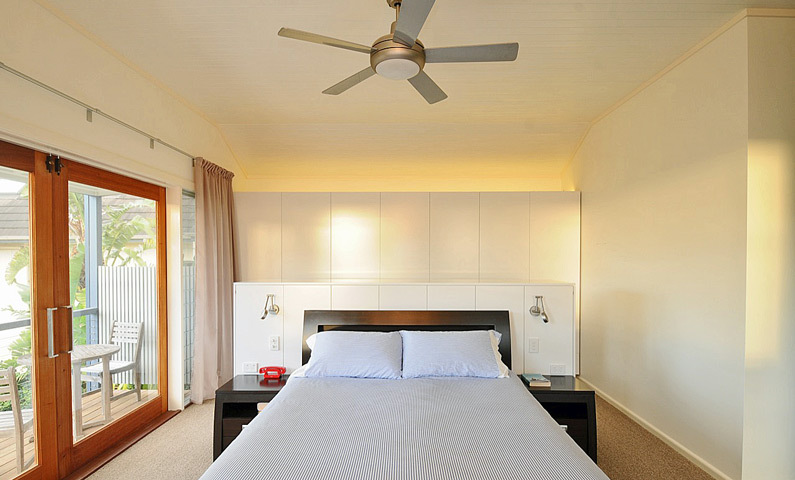 Along with the rest of the house this bedroom was designed with a classic beach lifestyle in mind. 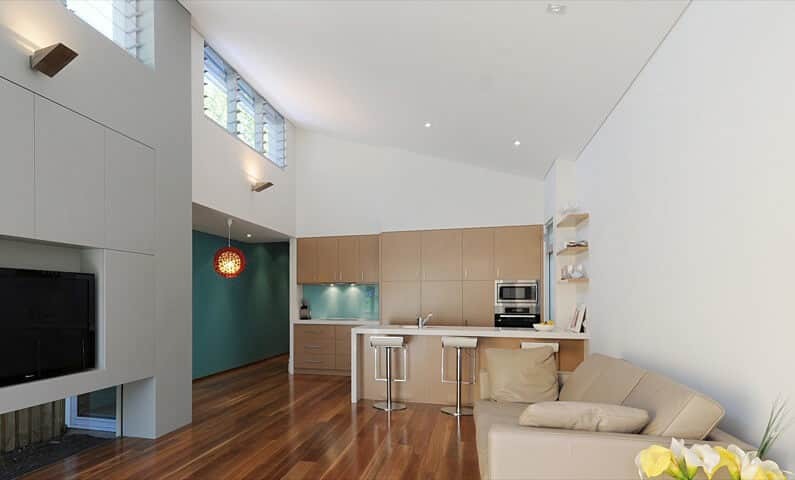 The light and airy room is highlighted by the 3 metre high timber lined cathedral ceiling. The use of subtle wall uplighting on the upper level creates a warm and romantic feeling. The layout of this bedroom makes use of the space well by creating a nice flow throughout whilst also ticking the requirement boxes for a master bedroom. The interior design concept focused on creating a contemporary and sleek bathroom that is child safe and accommodates future needs of a growing family. The minimalistic composition has created an elegant outcome that is both stylish and functional. The overall modern design concept was integrated with a child friendly focus, in order to create a bathroom that provides a safe, comfortable and functional environment, comfortably able to be utilised by all members of a family and in particular children. 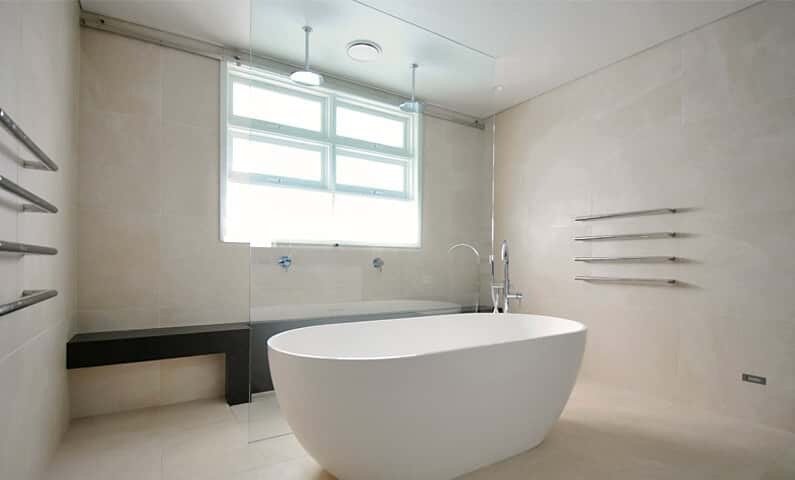 As with all of our bathrooms designs we ensure your bathroom is suited to your present and future needs.